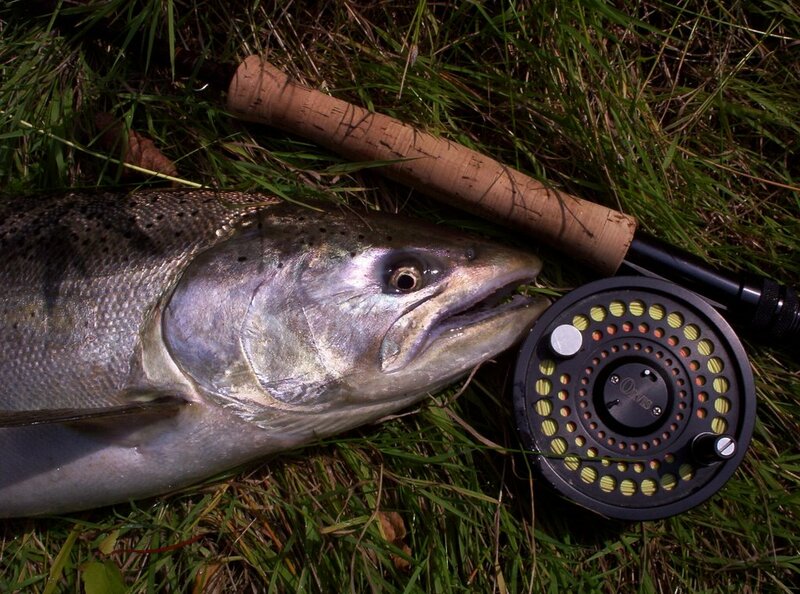 This Is John.H he is one of the most focused and determined fly-fishers new to the sport! follow-up"First Cast Refresher",on the Credit River and hook and landed a beautiful 17" Brown Trout. He then purchased a 6 wt. for Smallmouth. He used it at a friends cottage with great success. 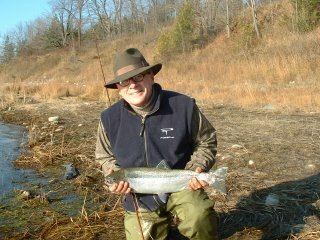 This was his second Steelheading trip with me,the First was on the Maitland,John landed a huge 12.-lb Hen that made him sweat. We took a few pictures and the fish was off. Unfortunately,I had some software issues and lost his first Steelhead photo's. With John's good nature we decided to go and try for another good Steelhead. 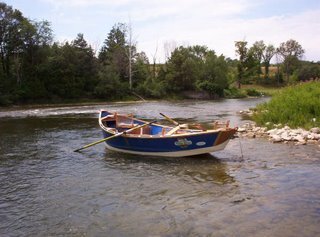 This time on the Saugeen River, I showed John a reliable technique and within a few cast John tied into this beauty. Well done John!! Watch this guy,he's going to be a hell of a fly-fisher. It won't take long. This is Amy, She wanted to take her Dad fishing for his Birthday. They fished together a long time ago, but as things go , it had been some time since the last fishing trip . Amy thought a day in the Boat would be a great Birthday Present. 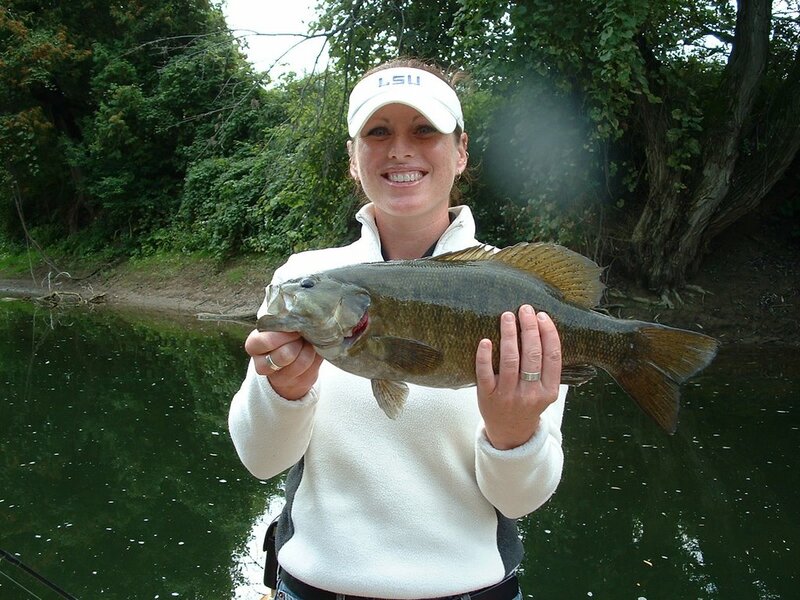 Funny how things work out, Amy hooked the best fish of the trip.. what a great fish!! Brad had a few fish on a "hulla popper" just not a big as Amy's fish!! What a crazy month,I apologize for the lack of posts. 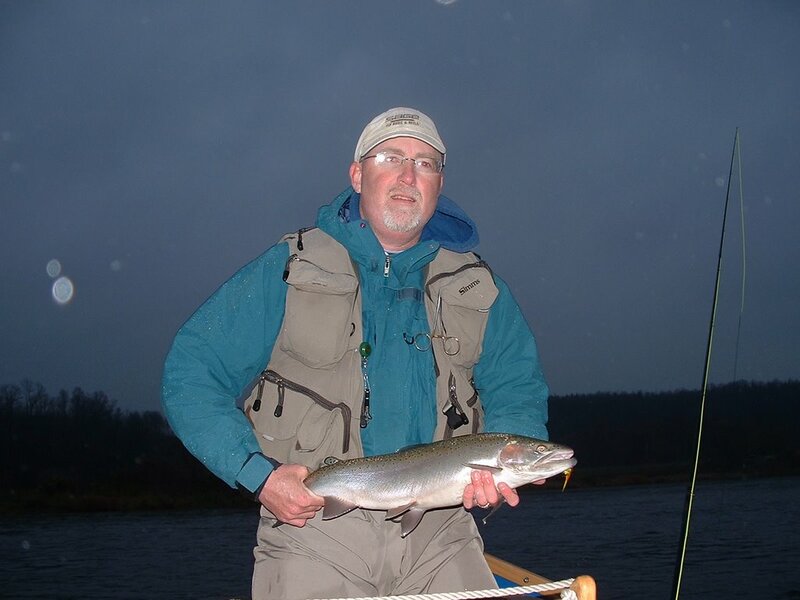 The Rivers are running bank full with plenty of Steelhead. I fished the Maitland with a good buddy John Warner a while ago and we managed a few fish. This one took a matuka spey in hot pink on the swing...hammered it too! John hooked his on a one of his own creations. Notice how Sulfur had to squeeze into the photo. Last week I fished the Saugeen for a few hours, managed a few silvers on spey flies. I may have to fish again this week! 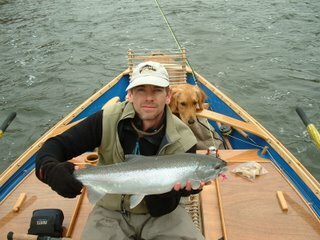 Remember it won't last forever, so book a day in the drift boat or a wade trip soon. We are now finally getting the rain we needed,and rivers are on the way up. September was a slow month for fishing and guiding with the new house and all. But we are almost in and fishing will be going full strength this weekend. We had some good day's in September although few and far between. The Saugeen smallmouth are still proving to be very happy to eat our flies. Had the Sage guy's out on the Maitland this past Sunday,not a banner day but we managed some decent smallmouth and a Chinook. The water was low and clear in fact I was whipped at the take out after pulling the boat over many rocks!! This rain will change that!! Check back in the next day or two.